Quick post before I rush out to go shopping at Westfields to pickup a few things including my giveaway prize. Super late I know but today has literally flown past and I've hardly finished anything I need to do! I might stop off for a cheeky YO! Sushi as well while Im there… because it would be rude not to! Plus I've been craving it for days! I didn't think I could top the outfit from the other day with the all Topshop outfit, but I've outdone myself today! I was looking through my chest of drawers and found this top that I hadn't worn for ages! It has one of the most unique looking collars I've seen as it has two individual layers. I don't think Topshop sell this anymore though so Im sorry if you can't find it! 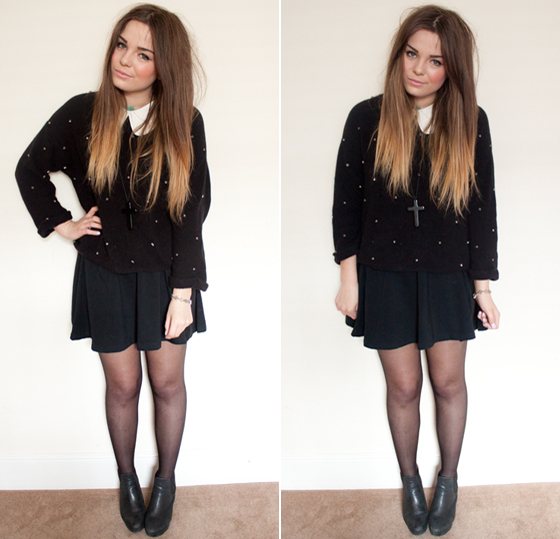 Also the boots (Topshop Allergera's) and the jumper are both very old too so I doubt you can get hold of them either! I always feel so guilty wearing old things as Im always asked about them! I need to start doing some sort of symbol for old clothing! As well as something to do with size of the clothes I buy as Im forever asked about the size of clothing I buy! Would you be interested in that? Anyway, back tomorrow for Birthday Bloggy celebrations! I should really plan what Im going to post about too! Eep! I've worn it all black way too many times in a row this week! eek! i wouldn't really know where to start though! maybe just writing old buy it? Have a nice time shopping! 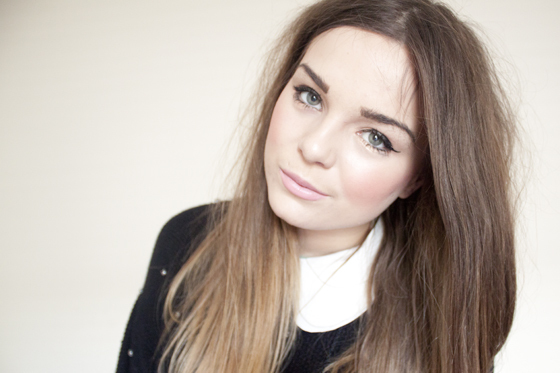 cant wait for tomorrows post! awh thank you! i should really be planning it now but my brains a mess! You make me need a collar. Do you buy your give aways yourself? i really need to wear some colour though! can't believe its been three days in a row! Your make up looks lovely here! 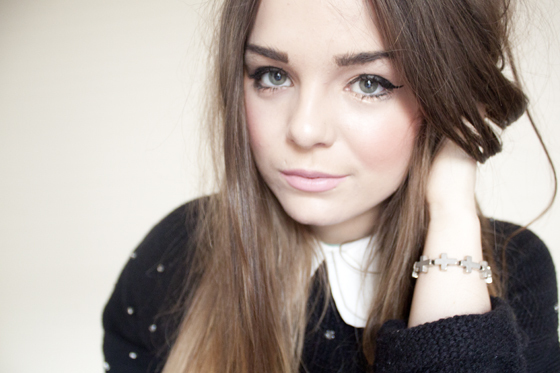 I have this jumper without the diamontes on, I always fall back on it! its one of my faves! you might still be able to find the shirt as its only a year old, but i think i got the jumper about two years ago! i normally write (old) next to it but what do i class as old! like is it something i bought a month ago, three months ago a year! its hard to decide what to do! you've been wearing too much black. would like to see the colors back again! I'm sorry, but if I'm wearing black… I'm wearing black in the blog post! Oh my god, that jumper much much much love for ! thanks, its my favourite nail colour! I love your jumper ! 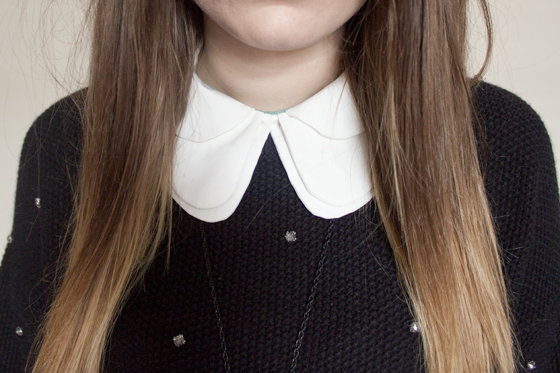 Love collars! You look lovely darling, hope you had a nice day! 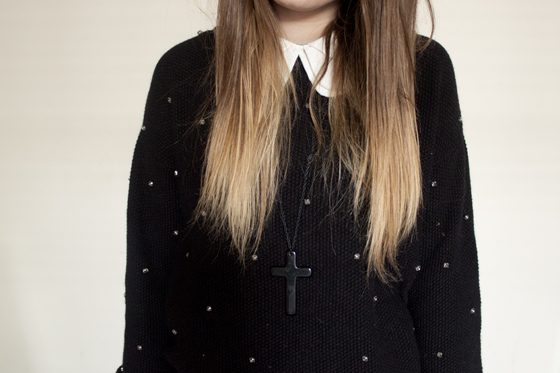 The petal collar top paired with the jumper is such a super cute look! Aw this is adorable Lily! That jumper is amazing! Hope you found everything what you needed! i might, but I've seen people critizied for "bragging" about their size, i generally wear 8 or a 10, and if i do wear something different i normally mention it! I love this outfit! The jumper is so cute! I love unique collars, it is hard to find any cute ones as there aren't many on the high street. Can't wait for Winter, as I think collars will be big again on the high street. thanks! still no idea what I'm doing though! yeah, its just awkward as some people see it as "bragging" about what size i am. im size 8 or 10 most of the time and if i do buy something a different size i generally say! haha, no not really, it just happens its what i've been wearing this week. plus its been so cold, dark and grey here i haven't had an excuse to wear or even buy summer coloured stuff! effortless, classic outfit as always Lily! I love that jumper! You're style is to die for! I love this preppy look, it's so pretty and adorable! I wish I still owned this jumper sighh! wow I love this outfit you look amazing! I really love your jumper and your shirt! Such a pretty outfit.. I love the jumper with the diamonds on it.. makes the outfit stand out. Love this outfit! I am now regretting not buying that jumper last year! Love the collar too. Its such a 'you' outfit!